As soon as death occurs your body becomes a potential food source for various insects. Natural History Museum forensic scientists study the insects associated with decaying bodies to help solve crime. This was perhaps the best hands-on part of Pestival for children. Under a tent (which had actually be used previously on real crime scenes) a simulated crime scene, complete with fake dettached hands and blowfly larvae, was set up. 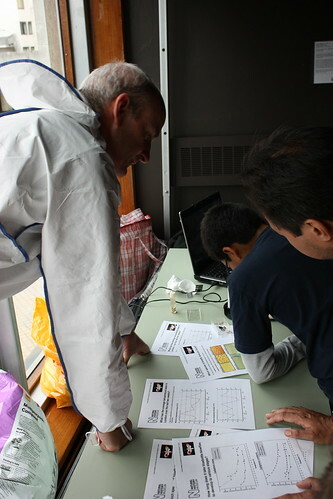 Under the supervision of Amoret Whitaker and Martin Hall you could collect the larvae and identify them. There was live adult blowflies on display and a display of other insects associated with decomposing bodies. You can see more photos of Insect Detectives on my Flickr pages.